What happens when the roles between the fisherman and the fish are reversed? How do we react when a great white shark is stalking us? Does it really make any difference if the shark just wants to play, or is intent on tearing flesh from bone? Kayak fisherman Paul Morris is one of very few anglers who knows the answers to these questions. It is a chilling tale that leaves this writer in awe of the sheer determination of the man who prevailed. 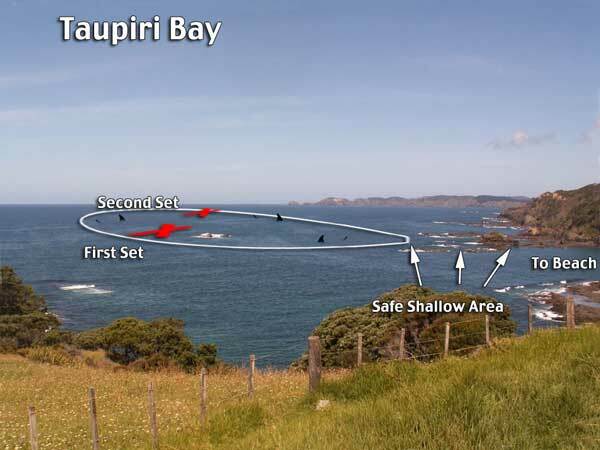 The following shark attack incident happened in January 2005 while Paul was on a fishing expedition at Taupiri Bay in Northland, New Zealand. As our family drove towards Elliot's Bay we stopped on a hill top which had a commanding view over the picturesque Taupiri Bay. It was from here I identified a likely looking reef system laying about 300 meters offshore, it looked perfect for my preferred style of fishing. I run a Paul's Fishing Kites boat longline from a kayak. 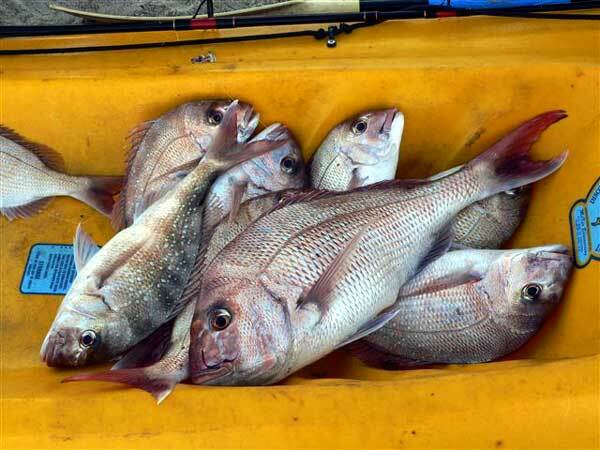 The next day was my first opportunity for a fish and, brimming with anticipation, I loaded my sit-on-top kayak with the longline gear, pilchards and squid bait, plus a pile of tuna and kina burley. It was slightly overcast and in no time I was heading out to fish the incoming tide. As I left the beach and I clearly remember looking back over my shoulder while paddling out and seeing the children playing happily on the beach. I was completely unaware that this was to be the start of the most terrifying ordeal imaginable, one that I would be very lucky to survive. Shark Attack Pictures : The incident happened at Taupiri Bay, Northland New Zealand. The two X's show both areas where Paul Morris set his longline. The shark pictures imposed show the areas the shark was most active. On reaching the outside of the reef I allowed the kayak to drift for a while to ascertain the best direction to set the longline. I decided on a set about 50 meters out from the centre of the reef on the ocean side. Counting the stoppers as the line was setting I determined the depth to be around 22 meters. As soon as the weight hit the bottom I could feel the snapper biting. 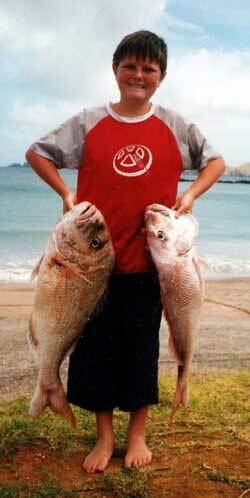 "So much for the local who only yesterday told me the fish were scarce," I thought. I got a couple of keepers from the first 15 hook set and released several smaller ones. The breeze had picked up after I had hauled in the line and this had pushed me 400 meters further southeast. I reset the line there, in around 27 meters of water. This time I set the full 25 hooks, I also dropped handfuls of burley between the traces to improve my chances of catching a good fish. It seemed to be working - I felt a couple of really good snapper bites as the line was being set. The wind then dropped completely and the sea became calm as I went back over the setline while dishing out more burley by hand. At the time I was unconcerned about the copious amounts of burley I had sloshing about in the self draining cockpit area, or that which was plastered all over the sides of the kayak. As I hauled the second set I noticed a lot of the baits hadn't been touched and wondered if the fish had maybe gone off the bite, but then a silver glint deep down in the clear water slowly came into focus. It was a good snapper, this is what I came for, I thought. But wait, what is that? Deep beneath the boat a long dark shadow was moving ever so slowly? At first I thought it could be a huge clump of seaweed drifting in the current, it was too deep to see clearly, whatever it was became tangled in my mainline and it all drifted under the boat. My first sense of foreboding doom began to creep over me when the mainline moved back to it's original position and the nice snapper I was hauling in lay on the surface before me. Most of it was missing - only half of it's head was left - and I didn't even feel it happen! It was then, out of the corner of my eye, I saw the large dark shadow moving slowly back towards me. As the shadow turned to shape I couldn't believe what I was seeing. Above : Shark Bait? One of Paul's earlier catches. He used to stack his fish and bait in his kayaks self draining cockpit. It was a big - no, it's bigger than that - it was a huge - no, - it had to be the biggest shark ever! The giant shark cruised slowly past my kayak. Initially it was almost side on to me and no more than five meters away, it was swimming in a series of "S" turns. Then, as the big shark came closer I realized that it was two to two and a half meters longer than my 4.15 meter kayak. At one point it's head was level with the stern while it's back half was still curving around in front of the bow. The shark looked blackish on top tapering out to an off grey and a brilliant white at the base of its head and gills. It also had a fresh deep gash across its tail. I was terrified - I could not take my eyes off it. I just couldn't believe the sheer size of what I was seeing, yet at the same time I was in awe at this magnificent creature. I remember trying to take in as much detail as I could to hopefully accurately identify this beast later. I knew it was a shark, I just wasn't sure if it was a great white. Then relief, was the shark veering off? It seemed to be heading back toward the reef, 20 meters away, 30, please keep going! "Oh no, it has turned, it's coming straight towards me!" A tonne or more of hungry shark is now heading straight for my little kayak and I only have centimetres of freeboard. The shark was moving faster now. A bow wave preceded it's huge bulk and the dorsal fin slowly rose above the surface, at it's highest it reached 30 to 40 cm clear of the water. As the shark honed in on me a wake appeared from its thrust and the tail fin emerged partially above the water line. Was death stalking me? A quiver of fear ran up my spine at the thought. Would it get me, or will I live another day to enjoy the sight, sound and laughter of my beautiful wife and children? It was about now that I promised myself that never again would I venture out in unfamiliar waters alone. I thought I was dead for sure, but then, just maybe, the shark only wanted the fish on the longline? I grabbed the knife and hurriedly cut the mainline away hoping to put some distance between me and the still hooked and struggling snapper on it. In my haste I accidentally slashed a deep cut into my left knee and dropped my knife overboard in the same action. This cut bled profusely into the self draining cockpit. Trying to stay as calm as possible, I decided to stay perfectly still, I was sure if I started to paddle I would only further excite the giant sharks interest in me. I was wrong, the shark wasn't interested in the fish on the line, it was still heading directly towards me. I momentarily closed my eyes as I braced for the first impact. When it didn't come I opened them just in time to see the head of the shark diving under the centre of the kayak. This thing was gigantic, it looked to be at least a meter wide between the eyes. As it continued on it's path the dorsal fin struck the kayak amidships and I had to swing my legs across and into the water to prevent a capsize. Above : A great white scaled to the size of Paul's kayak. 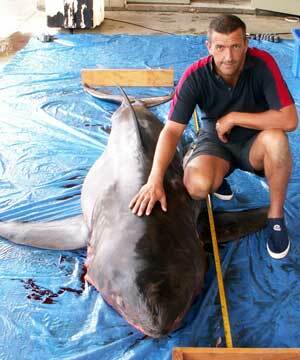 While it looks huge, six meters long is not the biggest shark ever found in New Zealand waters. The largest great white shark taken recently was a seven metre giant caught in a gill net at Waiheke Island. It is obvious that little could be done to disuade a shark this big if it was really determined! After the shark had made its first pass under me, it did a short fast turn. It was at this time I first saw the amazing white contrast of it's underbelly and realized - I was the bait sitting dead centre at the end of a burley trail of my own making. This burley already included fish bait and burley plus fresh blood from my cut knee - all of which was still draining freely into the sea through the scuppers in the cockpit. The shark was now very interested in what was on offer. 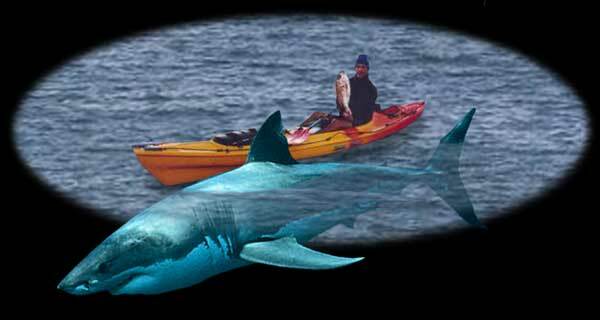 When the shark came back it started nudging the bow of the kayak. In hindsight the shark was probably testing it to discern the source of the scent and locate which parts were edible. It was all too much. Another more powerful wave of fear overcame me. My body was screaming, fight or flee NOW, but my mind was saying stay calm, keep quiet, and you might live. I completely lost control of my bodily functions. Bladder and bowels let go at that point, and I began vomiting. The burley trail now had new scents for the shark to explore, it started circling in an oval around the kayak again to check them out. I grabbed all my remaining bait and burley, put it into a bag with a sinker, and threw it as far as I could in the hope it would distract the shark. But it wasn't to be, it took little effort for the shark to inspect the bag before returning it's focus to me. The shark continued its oval circling vigil, first out wider then closing in and occasionally nudging the kayak. By this time I was vomiting all over myself. Still 400 meters out from the nearest point of land I decided to try to paddle very slowly towards safety, carefully I began by dipping the oar, but only when the great white shark was paying the least attention. Progress was excruciatingly slow considering how much I longed to be sitting safely ashore. When I looked up to take bearings I often lost sight of the shark - only to have it repeatedly surprise me, usually by bumping into the bow or stern areas or coming up from below. It seemed as though time itself had stopped. I was crying my eyes out, certain I was going to die. I even tried swearing at it to stop and leave me alone. The shark ignored my pleas, it bumped into me at least 12 times over the next twenty to thirty minutes. As I was finally nearing shallower water the shark somehow pushed or pulled the stern of the kayak under the water, I think it didn't want me to get away. I didn't see exactly what happened as I was looking ahead at the time. I was still at least 100 meters from the rocky outcrop that promised safety if I could only reach it. I had the will, and I begged God to give me the strength to try and make it. Then, with all my heart and every ounce of power I could muster I paddled frantically towards the shore - away from the icy grip the shark had held over every movement I made. As I neared the shallower water I cast a look over my right shoulder and saw the shark veer away from the jagged inshore rocks, turn and head back to the outer reef. I paddled the kayak slowly through a series of very shallow reefs and back to the beach. The mixed emotions I had coming through the shallows to the beach was a combination of extreme fear and utter relief at the same time. For me it is a feeling that I cannot adequately put into words even now. I was later told that upon my arrival back to shore I was white as a ghost, uncontrollably shaking, vomiting and crying, while continually repeating how big the shark was. During that night I had cold sweats and woke up to my son, Peter shaking me. He told me how I wasn't breathing properly and had been stopping breathing for up to a minute and a half at a time. This was the first realisation that the events of the day had affected me deeply. I rang the police to advise them of the shark. They asked us to call them back if it was still there so we all went back to the top of the hill and there it was - still circling the outer reef. After ringing them back we watched it for the next six hours, along with a lot of other curious people. One tourist filmed the shark for a good 15 minutes. A boat load of people even went out to the reef for a closer look. One started snorkelling but only lasted a few seconds before climbing onto the reef. He stayed there until the boat came right up to the rocks so he could get back onboard without entering the water. Their boat slowed as they went past the shark so they may have got a good look at it. The most obvious outward sign of how deeply the shark attack had affected me was that I became a chronic stutterer from the time I arrived back at the beach. This condition lasted for weeks. At a personal level I went from being a confident kayak fisher to sleepless nights plagued with nightmares, I was unable to concentrate for long periods of time. My whole world was turned upside down. I eventually sought counselling and required medication to get through it all. It was months before I was finally getting back to being normal. Within six months I was back longlining from my kayak. 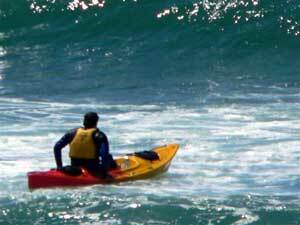 This is me heading out through a big surf rolling in at Pakiri Beach. Photo Below : Although I was still pretty concerned about sharks I refused to let it stop me fishing. 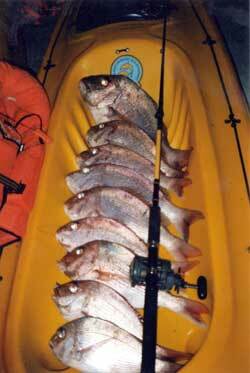 The schooling season was on and I got a limit bag of good fish. I do not blame the shark for what happened. As a good friend told me, I was the one that rang the dinner bell by having distressed fish on my longline, burly in the water and made myself appear to be part of the potential meal. After returning early from my holiday I needed to find information on sharks, in particular I really wanted to know what species of shark it was for certain. I was also hopeful of getting a better understanding of why it acted the way it did. I contacted Andrew Christy of Kelly Tarltons Underwater World, they are noted for their expertise in sharks and their salt water sharks tank. I described everything that happened right down to the smallest detail. Andrew told me he was absolutely sure the shark was a great white and gave me a lot of very helpful facts about sharks. Apparently great white sharks have very good eyesight and it would have been visually checking me out when it was doing its S turns. I also learnt other interesting facts on sharks, like the shark would have also been using its electro magnetic sensors that are located around the mouth, as well as down the lateral line, to detect my pulse to determine whether I was fit and well and a threat to it, or slowly dying and a potential easy meal. I also found out that oval circling is typical ploy used by great whites to disorientate their prey, it certainly worked on me. A reduction in the size of the circles is also common prior to going for the kill or just striking with its mouth to confirm if the object of interest is food. When I asked Andrew why did it not just eat me, he explained it may have been undecided as to whether I was food or a possible threat to it. The shark may have been in calf or even just curious to find out what I was. I asked if I had done the right thing by initially staying still, then slowly paddling towards shore with as little disturbance as possible. He said that considering that I was still alive, what I did at the time must have been the right choice, but only on that day, and only with that particular great white shark! There is still so much to learn about them, every shark is different, he added. I hope that reading about my experience will make others more aware that when we are in their world it is a good idea to minimize the risks of shark attack where possible. A big thank you to Andrew Christy for all his helpful knowledge. After the incident Paul Barnes posted a short article on this website and wrote the article above for "Fishing News". The response from these two articles has been fantastic. One result was the TV show "20/20" picked up on the story and during the course of making the show I got to go to an autopsy on a 3 metre white shark and find out even more facts about sharks. I was particularly amazed at the huge size of of the sharks liver and the tiny brain in control of such formidable weaponry. 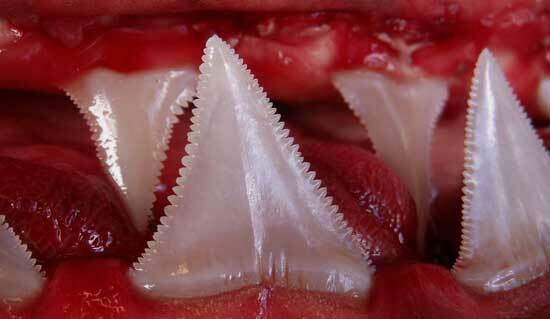 Above : The shark jaw close-up showing how sharp a serrated white shark tooth is. Right : Paul Morris up close to a great white shark half the size of the one he encountered. 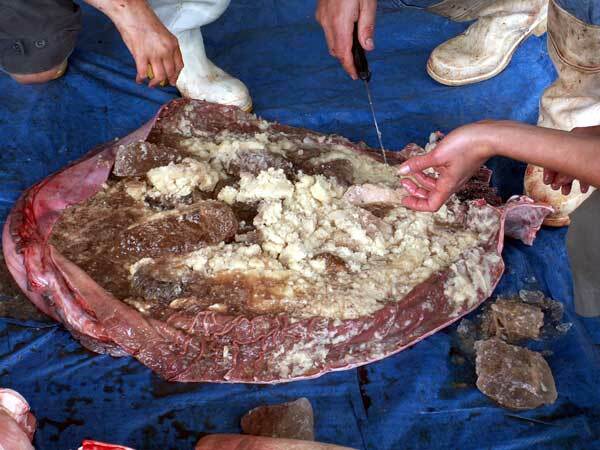 Above : Great white shark attacks whale, the sharks stomach was removed and found to be chock-a-block full of whale blubber. There was no way of knowing if the shark attacked and killed the whale or was simply feeding on a drifting carcass.